Gerard Place began as a cooperative effort among 12 congregations of women religious in the Buffalo area. It was a response to the needs of single parents for safe, affordable housing. Knowing the importance of education and employment in empowering people and communities to rise from poverty, the Gerard Place President, David Zapfel and the Board of Trustees, along with supporting LCWR Buffalo congregations, began to dream six years ago of converting the existing gymnasium, bowling alleys and upstairs classrooms for new use. Partnerships with M&T Bank and Edu-Kids made possible a brand new preschool program for 104 children aged six months to four years of age. Training for certified nursing assistants, home health aids, hospitality and culinary workers are planned in collaboration with various partners. A hot dinner will be served to neighborhood residents in the gym two nights a week; this is in collaboration with Friends of Night People. All programs are open to neighborhood residents and are within walking distance in the Zip code 15 area, named The Promise Neighborhood. 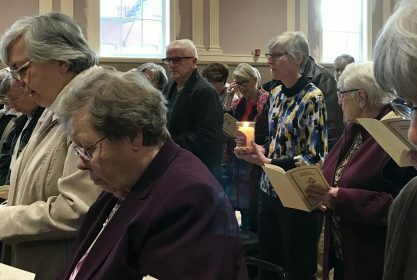 On November 3, 2018 many sisters from LCWR Buffalo congregations gathered with staff, Board of Trustees, Advisory Board and donors to celebrate Eucharist. It was a true thanksgiving for this new venture and for all of the children and adults who will be encouraged by these opportunities. The Grey Nuns were well represented. Sister Denise and our Leadership Council joined in the celebration with many Buffalo GNSH. Sister Barbara Schiavoni, the GNSH on the original Board of Trustees, carried the candle representing our congregation in the entrance procession. Sister Marita Campbell and Sister Sheila Stone, past and present Board members respectively, participated in the event. Grey Nuns’ sharing in the sponsorship of this new work reflects the continuation of Marguerite d’Youville’s care for the poor among us in new and creative ways at our time in history. The National Religious Vocation Conference (including our own Maryellen Glackin) invited David Zapfel to speak at their conference this same weekend in Buffalo. They collected $1800 for the project.